FFWPU Australia: We began the Third Year of Cheong Il Guk with True Parent’s Day and True parents Birthday celebration. 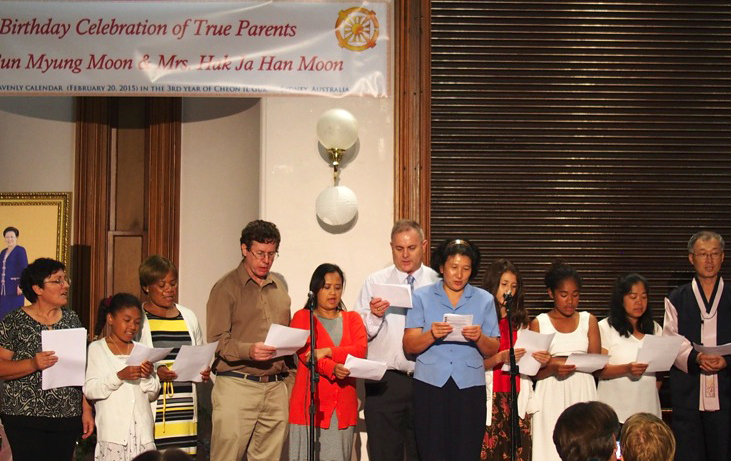 On the first day of the first month according to the Heavenly calendar (19 Feb 2015), we celebrated the 48th True Heavenly Parent’s Day in Sydney, Australia. The pledge service began at 8 am with the attendance of blessed families, local youth and the Peace Embassy members. During the “kyungbae” ceremony, families took turn to offer bows to Heavenly Parent and True Parents, followed by couples offering bows to each other. Finally, the children offered bows to their parents. In return, children were given some small gifts and well wishes from the parents. After the hoon dok reading by Issei Miyoshi, Rev Soon Teck Lim delivered a presentation entitled “2014 in Review: Ten Developments in Australia.” Finally, the celebration concluded with the three cheers of Eog Mansei by Trinh Nguyen. It was a great start to the New Year in 2015. Prior to this day, blessed wives and center members prepared the offering table with sincere heart. Rev Insoung Kwun, the Oceania regional president, invited members who prepared the offering table to the lunch. Since it was a working day in Australia on the first day, blessed couples who couldn’t travel to the Peace Embassy offered New Year pledge and prayer with their families at home. The next day, we prepared the celebration of True Parents’ birthday and invited all members and Ambassadors for Peace to attend. 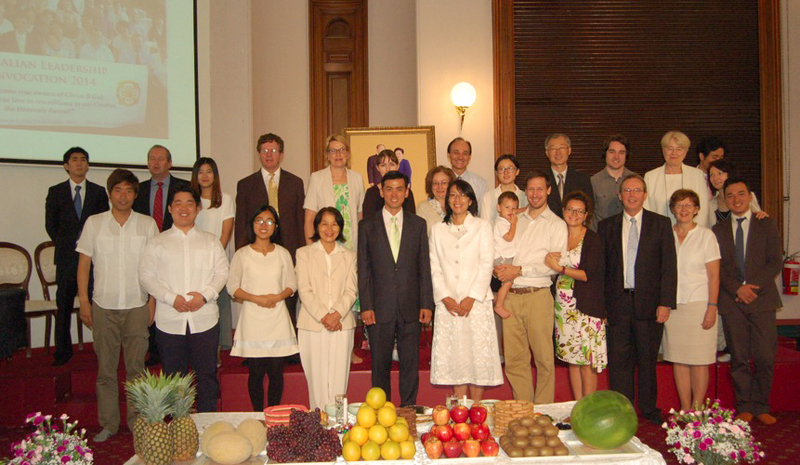 The birthday celebration of True Parents was held on 1.2 on the Heavenly calendar (20 Feb 2015) at the Oceania Peace Embassy. The gathering was well attended by blessed families, local youth, and the Ambassadors for Peace. The purpose of the celebration was to express our gratitude and joy for the birth of True Parents. Throughout True Parents’ lives, they live for the sake of liberating God. They taught us that God is our Heavenly Parent and we are the children. However, due to the Fall, our relationship with God has been severed. As a result, God lost His children and we lost God as our Heaven Parent. Consequently, we lost each other as brothers and sisters. Division, barriers, and conflicts were established in the world. Today, we are divided by the walls of language, culture, religion, and nationality. We believe that Heaven has sent True Parents in order to bring humankind back to Heavenly Parent under the vision of One Family under God. In order to realize this vision, True Parents sacrifice their lives day and night. Their lives have been dedicated to the unselfish giving and unconditional love to humankind, even to their enemies. In all, True Father experienced six imprisonments and overcame tremendous suffering in his native land of Korea and in the United States. The evening began with a brief introduction by Mark Burfield regarding the significance of the celebration. This was followed by the singing of Cheon Il Guk anthem. Jynene Helland gave the opening prayer. Two second-generation members presented bouquets of flowers to True Parents. After that, the Ambassadors for Peace joined the representative couple to cut the celebratory cake for True Parents. This was followed by a presentation of video about True Parents entitled, “A Peace-loving Global Citizen.” Rev Soon Teck Lim, president of the Unification movement in Australia, delivered a speech to the audience. After the main address, a well-prepared dinner was served. 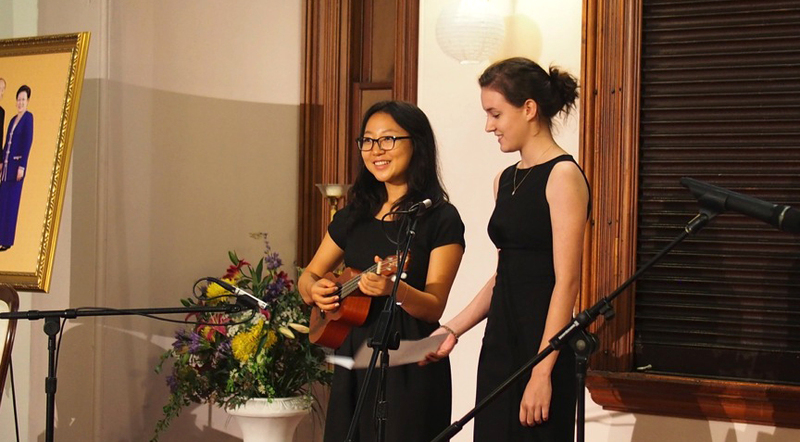 This was followed by the musical performances and concluded with a closing remark by the masters of ceremony. Participants could experience the grace and love of True Parents through this celebration.